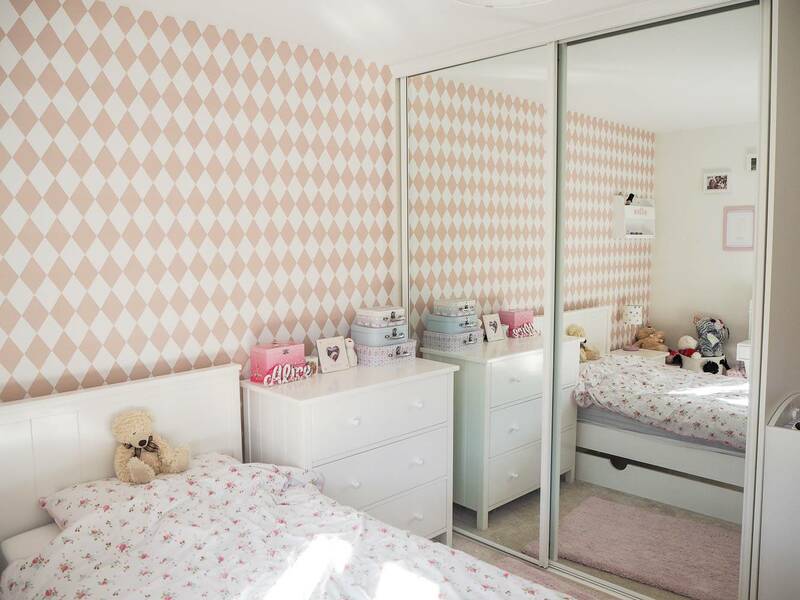 When we moved into our house I wanted the girls to feel settled quickly and I didn’t have time to fully decorate their bedrooms and I used wall stickers to add some detail to their walls. 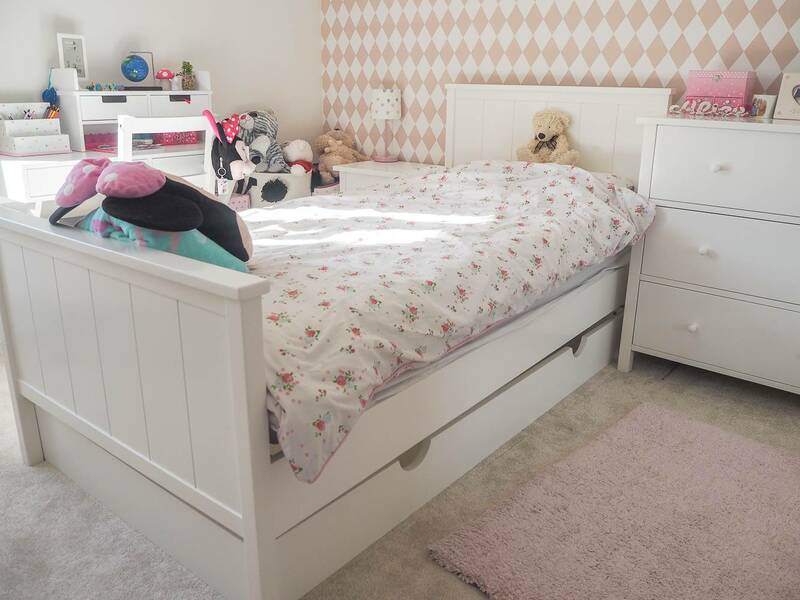 Alice loved it, but nearly two years later she is fast outgrowing it, along with her bed and chest of draws deciding to break, it was time to redo her bedroom. I wanted to create a space that would grow with her, where I can use accessories and prints to make it feel personable and bring her personality to the room. Whilst also meaning that these can be changed as she grows up and her tastes change, without me having to completely re-decorate her room. Alice had asked for a pink wall, which is what she had in our old house. I then found this pink diamond wall paper and Alice loved it. I used it for a feature wall in her room and I’m so pleased with how it looks. It feels like it will last her a long time and she won’t out grow it anytime soon, if ever. Alice previously had a cabin bed and I thought that she would want the same again, but she surprised me and wanted to have a normal single bed. This gave me more options on the layout of her room and we completely changed the layout, which has made the room look a lot bigger. I choose a bed that gave us storage underneath it, as everyone with children knows, storage is everything. I use the draw underneath to put her summer clothes in, whilst it is winter and also to store clothes that I’ve brought in the sale for her to grow into to. This style of bed is definitely built to last and I can’t see a time where she would outgrow it. One thing that we also needed to look into was her mattress, as Alice currently had one that had a plastic cover, which we brought when we were potty training her and it was brilliant at that time. Obviously Alice no longer needs one like this and it was time to get her a mattress that would be more comfortable to sleep on. Give her more support and hopefully a better sleep. We were kindly sent a single mattress from Casper, their mattresses are designed to provide, support, comfort and regulate the temperature throughout the night. Giving a comfortable nights sleep and for any parent, this is what we want our children to have. Alice loves her new bed and mattress, she says it’s really comfortable and the bonus for us, is she is sleeping for longer. Which is a win! The chest of draws and bedside table are from the same range as her bed and they fitted in perfectly either side of her bed. the draws are nice and deep, giving us plenty of room for her clothes. One thing that Alice really wanted was a desk in her room. She loves to sit and write and with the new layout of her room, it gave us space to fit one in. It fits well next to window and Alice loves to sit and write stories, poems and I love to watch her. It reminds me of myself when I was a little girl. Over her desk is a gallery wall that was she already had, which is a great way to make a white wall more interesting and it doesn’t just have to be photos as you can see we have a mixture of things that make up her gallery wall. I wanted to create a space for Alice to sit and read her books too. She is a little book worm and I wasn’t originally sure how much space I would have for this. With the furniture in place, there was a corner that was the perfect for it. I was thinking of putting a floor cushion down for her to use, when I remembered a gorgeous chair my friend had recently brought for her daughters room, that I knew would be perfect and Alice would love it. The storage trunks were originally mine to go next to my desk, but unfortunately my desk had to be returned (long story) and they needed a new home. 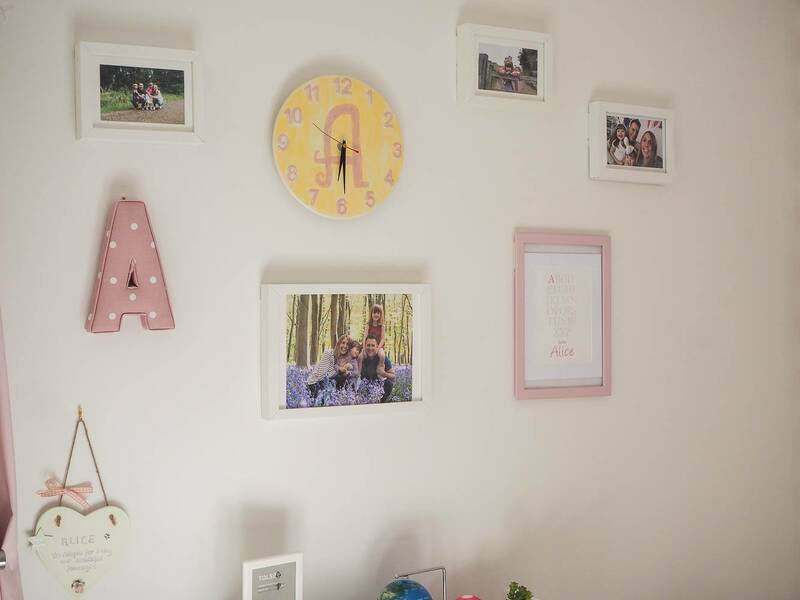 They go perfectly in Alice’s room, adding a nice contrast of colour and they hold a lot in them, which is brilliant as Alice has a lot of stuff! One of my favourite parts of doing up rooms is adding the little touches. Finding little treasures in shops that would go perfectly. 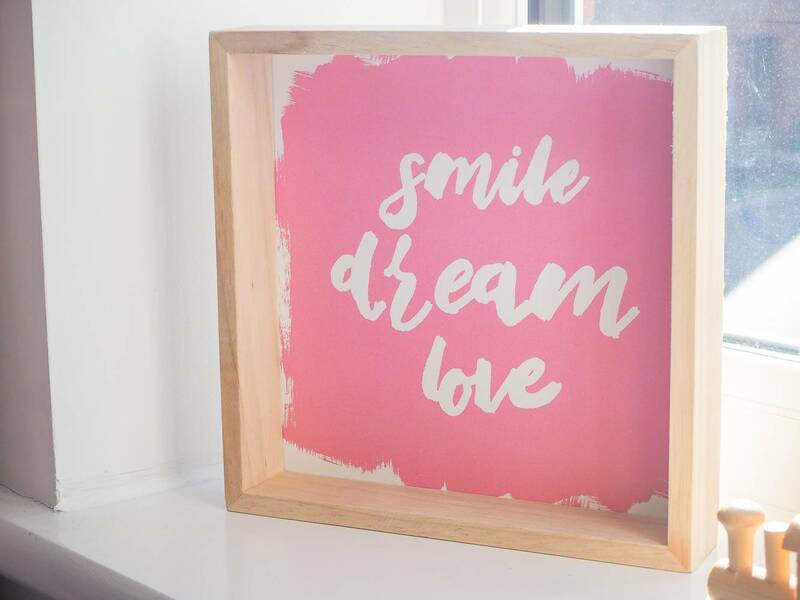 I saw this frame block in Sainsbury for £2.50 and I just love the words and splash of colour. 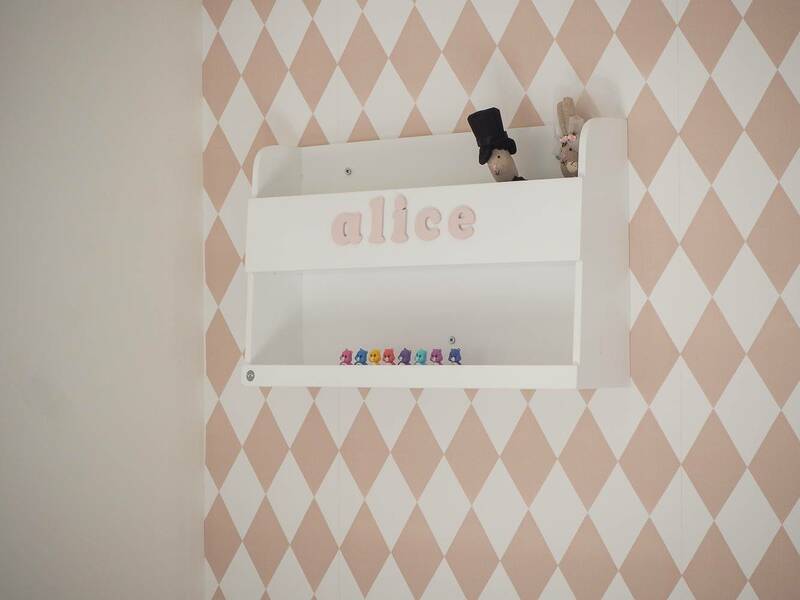 Alice’s room is 90% finished and after a recent trip to IKEA I have some shelves to put up next to the storage trunks. I also want to change her bedside lamp and ceiling lampshade, but I can’t find exactly what I’m looking for at the moment. The good news is Alice loves her room, she thanks me regularly for her new room and I love to see how happy it makes her. It represents her personality perfectly and its a room that I love to go in. 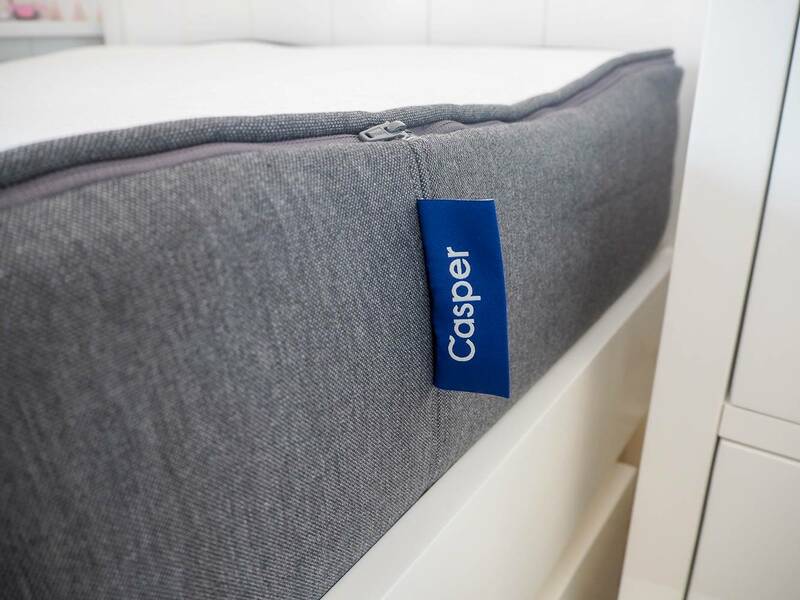 Disclosure: This is a collaborative post with Casper Mattress and we were kindly given our mattress in order to produce this post. All views, opinions and photos are my own. Wow, what a gorgeous room. I need to sort my girls’ room out, it’s definitely my parenting nemesis as theirs isn’t great at the moment. They both need new mattresses too and the Casper one sounds great, I’ll have to look into those when we’re ready to buy ours. 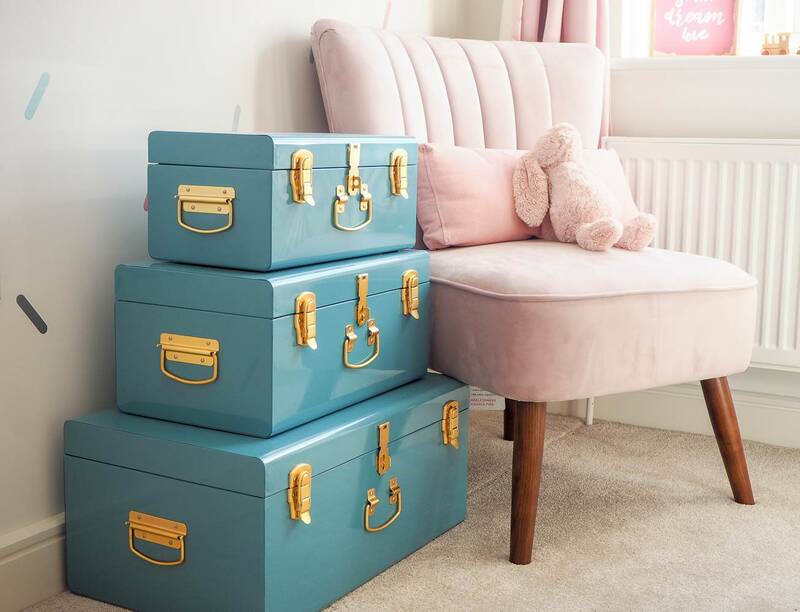 I love those storage trunks, they’re fab. That looks so smart. It’s weird to think how quickly they’ll grow up. Bless. Alice’s room is just beautiful. It’s certainly like something I dreamed about as a young girl. Sadly I never got mine as I shared with my sister. But you’ve done her room so lovely! I love her room. The mattress looks very nice. FABULOUS bedroom! And I love that wallpaper – and those blue trunks! 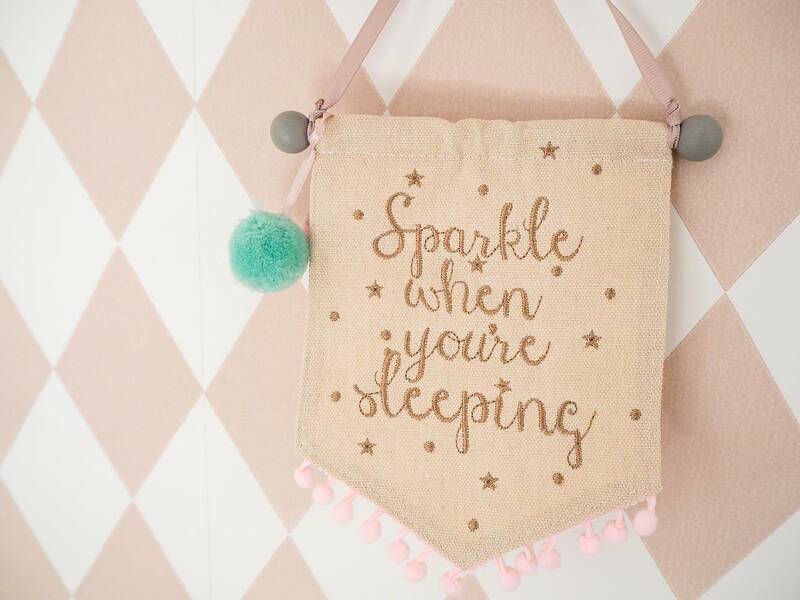 This is such a fabulous girl’s room. I think I would still stay here even up to my teens if i had a room like this. Oh we have the same tastes as my daughter has the same bedding. The room looks sooooo good. Oh Laura I love this room, my girls share a room and we just have so much stuff it always looks so busy!!! I would love to create a space like this for them. I love this so much! Her own pretty little space to become whoever she likes! You have set thup canvas for her, I’d love to see what it looks like when she’s 18! Oh this is such a beautiful room. Alice is very lucky. Love the desk as well and the little reading nook. This is a room that will grow with her too. Oh gorgeous!! We are going to be doing the girls next year when the extension is done and I can’t wait to get it all decorated. 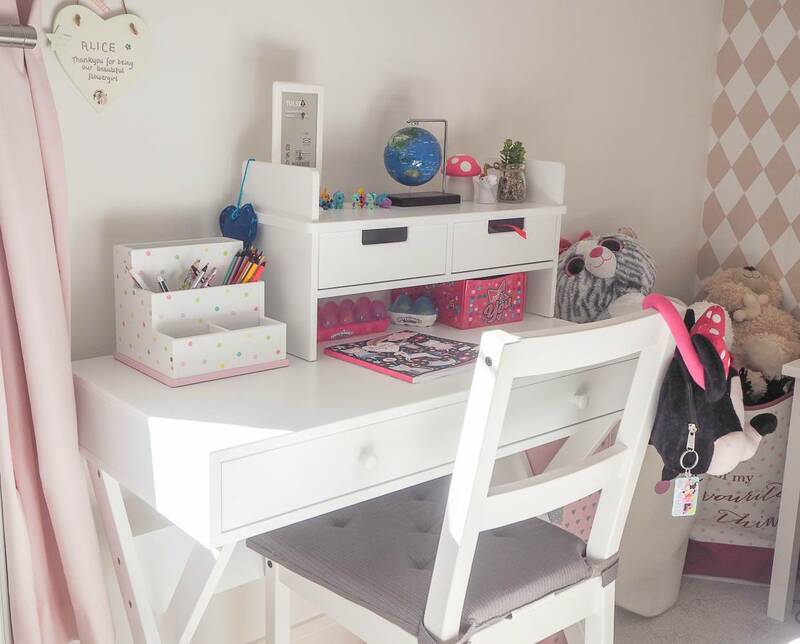 I love the colour scheme you have here, and that little desk would be a real favourite with Eva! What a gorgeous room! I love that desk – can I ask where it’s from?